Revealing mistake: Throughout the racing shots of the movie, the close up shots of the fans in the stands show the same people used multiple times as evident by them wearing the same clothes, poses, etc. Continuity mistake: At the end of the scene where Speed and crew are ambushed by Cruncher Block in the mountains, Speed is pointing a gun at Cruncher Block. When Spritle says "Take him away, boys", we see Speed in the background lowering his gun, but, in the next shot, the gun is raised again. 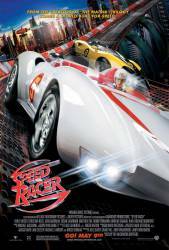 Trivia: The throttle control in Speed Racer's car is the throttle control from Saitek's X52 Flight System. Trivia: In Speed's first race scene, the elderly man announcing is the person who did the voices for Speed and Rex in the American version of the original cartoon. Mr. Royalton: Pancakes are love.